Each and every game has a pivotal moment where victory is decided. Not always the game winning play, but a play that determines the outcome, and if it went differently, a different result would be likely. So each week we will explore the exact moment of drama where the game is decided on: As the Game Turns! On Sunday, in that hazy, rainy day along the banks of Lake Erie, the game started like any other game under terrible weather conditions. With messy play and multiple turnovers. Still, even after throwing 3 interceptions, the Steelers were leading by 14 points after the Browns attempted and failed to get a first down on a 4th down pass attempt to Jarvis Landry. The Steelers took over on the 18 yard line with 7:44 seconds and victory all but assured. All Pittsburgh needed to do was control the clock and pick up a few first downs, and at the very least, punt again to force the Browns into a long field situation to eat clock by attempting to score twice. 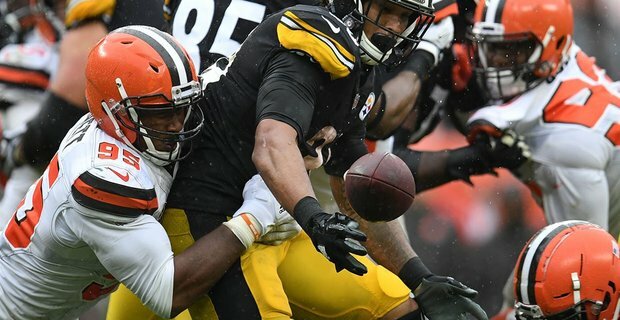 With all the great planning, and correctly calling a run play to take time off of the clock, Myles Garrett made a big play to knock the ball loose from James Connor, and force a fumble that was recovered by Jabril Peppers, who was tackled at the 1 by Ben Roethlisberger. Instead of eating the clock, this drive only lasted one play, lasted only 8 seconds and gave up 17 yards as well as possession. This set up a first and 1 on the goal line, which the Carlos Hyde took into the end zone on the very next play. Connor’s fumble was not only the catalyst for a Brown’s score, but also preserved enough time on the clock for them to score again to tie the game. What should have been a game clinching drive to win in regulation, turned into the impetus that let to a split decision. ← Previous Story James Conner is Leading the League!